What’s this? Gonzo Green on a Family Guy review? That’s right, folks, I’ll be taking over the FG job for a bit – but don’t worry, I have some experience: I wrote a review of an episode for my BubbleBlabber interview like four years ago. So, now that we’re all good & reassured, let’s get into it. Peter, Joe, Quagmire, and Cleveland saw a crappy horror movie sequel and decided to make their own. To get some inspiration, they journeyed to the town’s creepy old asylum. Peter pitched an idea about a giant cat-like killer stalking teens, Cleveland’s only dealt with lightbulb changing, and another one had deadly soap, but the guys only ended up frightening themselves. Spooked, they killed the asylum’s caretaker, having mistaken him for a hook-handed murderer, and buried the evidence. The guys began to turn on each other under the pressure of keeping the event a secret, but realized this situation would make a great movie. They followed through, and it flopped – but on the bright side, the caretaker turned out to be a KKK leader. Meanwhile, Brian got a new pair of glasses and began seeing himself as more intellectual and intelligent, much to Stewie’s annoyance. Stewie of course put him in his place. 1) I would love to watch an actual version of Maniac Pope 2. 2) The full name of the nuthouse was the Quahog Asylum for Lunatics and Mestruators. 3) Joe used his own leg to beat Albert the caretaker. 4) The guys’ movie was called Cereal Killer, starring John Goodman. Since I didn’t cover the first three episodes of Family Guy this season, I’d like to clue you in to how I felt about the year thus far. I actually really enjoyed the season premiere, “Pilling Them Softly.” Something about getting to see Stewie all drugged out for an entire episode was infinitely amusing. The second, “Papa Has a Rolling Son,” was relatively forgettable, and the most recent, “Guy Robot,” was surprisingly good, but not great. Now let’s get to last night’s. The formula was solid. On one hand, this was a Halloween episode. I mean, it didn’t really deal with the holiday, but there was that spooky feel to it, and of course the timing was no coincidence. But it was also just another instance of Peter & his buddies coming up with yet another half-baked scheme. This reminded me a bit of Peter’s attempt to produce a film – Steel Vaginas from season five’s “Chick Cancer” – but other than them both being a flop, there weren’t too many similarities. This episode was more about the brainstorming process, as opposed to focusing on the movie itself. I also wasn’t knocking the story by saying it was “yet another” scheme, because this is plot device the show is fully capable of repeating whenever they need a vehicle for a good idea. Overall, I think what worked best was the series didn’t try to do too much. In other words, they didn’t repeat some of their past mistakes. They didn’t go too Halloweenie and build things up. They didn’t milk the violence of the murder itself. They didn’t spend too much time focusing on the emotions behind the killing. And they didn’t make it too dark, even adding the Nazi thing to remedy the murder in the end. They took a simple idea, made it into a simple story, and ended it cleanly. 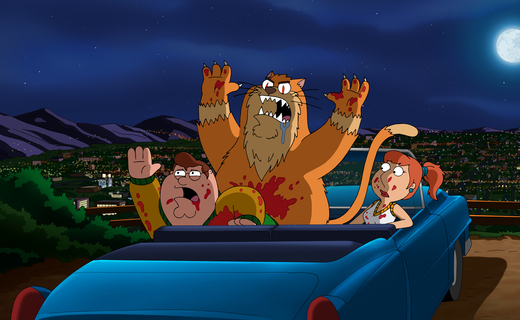 In fact, the only instance of doing too much perpetrated by Family Guy last night? Including the side story about Brian and Stewie, which was completely unnecessary.